We got so much entertainment value out of all the entries from the Creative Loafing contest a few weeks back that we must share them all. While Casey, the Head Brewer, may not have picked these to win a prize from the tasting room, the whole Coppertail team feels that some of these are pretty fantastic. Keep an eye out for your artwork and the potential for another contest such as this. Thank you again to all of those who entered, we truly appreciate all of the art work and creativity that went into each drawing (or follicle placement). Last week, our friends at Creative Loafing cooked up a fun contest where we all asked you guys to get a little artistic with Casey’s facial hair. The response was more than we could ask for and we are pleased to announce the winners. 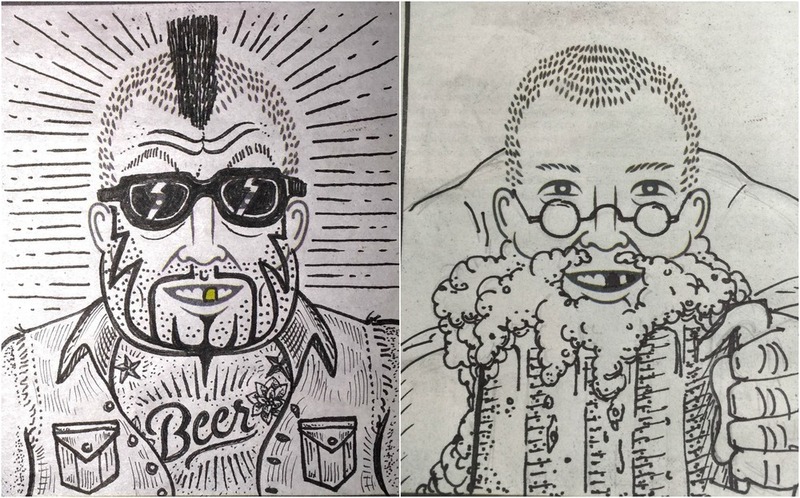 Check out these hilarious (and also very well done) renderings of our Master Brewer, Casey Hughes. Winners of a growler and complimentary fill (left to right): Kristin Northrup, William Casey and James Branaman. There were also these two amazing creations that we just couldn’t say no to. We all felt that the two below drawings were so great that we are offering these artists a free pint on us. Honorable mentions (from left to right): Conrad Garner and Christian Dyer. We appreciate everyone who participated and we had a great time reviewing each entry. There were so many great drawings that we truly had a difficult time deciding on just three winners. We hope to have another contest such as this one day in the future and can’t wait to see what else you guys can come up with.